This professional training course gives you the confidence to work deeply with the body and body symptoms, as well as nutritional, emotional and spiritual difficulties. 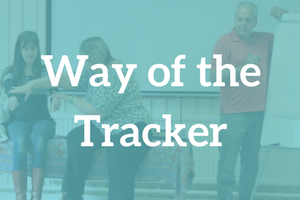 You will embark on your own healing journey and learn to become 'the tracker', the instinctive body detective helping to support another person through their healing process. Perceptual BodyTracking involves you in a personal development journey of self discovery. If you are interested in self-healing and exploring the root causes behind your own symptoms as a way to learn, then you will enjoy this course. Students develop their tracking skills, and learn how to become a professional body detective, using the tool of muscle testing to investigate and access the body’s wisdom and truth. Building on what has been previously learned in the Foundation course, the student is shown a co-creative way of working, as the muscle tracking gives both practitioner and client clues about what is happening in the body, as well as in the conscious and unconscious self. In this way we are able to go deeply into inner wisdom and speak the language of the body to find the answers within. Deepening listening and witnessing skills are an integral part of this training. As we seek to expand the extra senses and deepen perception, we learn to listen to the rhythm and pace of each person’s body, whilst allowing emotion to flow and be heard. Students will learn how to 'hold' a healing space for another person so that the process of change may happen. In this way, participants are encouraged to develop a deeper relationship of trust with their own body, as well as their inner wisdom, instinctual knowing and healing abilities. A key aspect of this training is the building, strengthening and making of relationships between different parts of the body. Certain aspects may have become disconnected or separated from the whole, causing imbalance, pain, trauma or difficulty. An invaluable method of forming body relationships is the simple and powerful tool of 'Two Pointing' (introduced in LifeTracking). You will experience taking this tool to a much deeper level in order to re-establish connections within the physical body and the energy systems. Whilst witnessing and listening skills are perceived as prime healers, Perceptual Bodywork also holds some wonderful bodywork and balancing methods that help heal body, mind and soul, derived mainly from Applied Kinesiology. Students will experience the powerful healing tools and techniques that address the body on all levels. The embodying of this material will help participants gain the confidence to embrace and work with the symptoms of aches, pain and discomfort experienced by many people in their daily lives. The energy of the physical body is addressed by listening and witnessing the energy within the muscular system, the bones, the joints and the ligaments. We also work with subtle energy. Here you will enter the world of the energy field and the aura, connect with and deepen relationships with Chinese Five Elements and meridians, as well as making a fascinating exploration into ancestral energy. This will involve the healing and balancing of The Eight Vessels - the Extraordinary Ancestral Meridians. 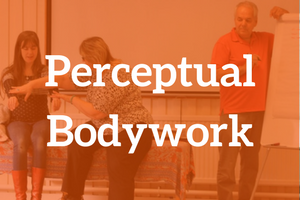 The Perceptual Bodywork course allows you to take a journey into the many realms of the body, including the physical, nutritional, emotional, energetic and spiritual. Self awareness and personal growth can be enhanced as the story behind a person’s symptoms comes to light,and the body is able to release stress that may have been long held through trauma, accidents, illness, difficulty or periods of stress in our lives. The body can still hold stress long after it has been dealt with on a mental level and such release can bring renewed harmony to the mind, body and emotions. Perceptual BodyTracking involves you in a personal development journey of inner exploration and self discovery. If you are interested in self-healing and exploring the root causes behind your own symptoms as a way to learn, then you will enjoy this course. The teaching of this type of professional course involves plenty of group work as well as work in pairs. You will learn by addressing the live symptoms and issues that you and the other group members bring. Although there is a set syllabus to cover, there are no mapped out modules – instead the agenda is facilitated by the trainer according to the needs of the group. In this way, students learn how to follow the energy flow of a session and allow it to unfold, which is one of the fundamentals to professional practice. At the end of the course you will be required to take a practical assessment in order to demonstrate what you have learned and to show that you are competent to work with the general public. Rather than a test or exam, this is seen as a rite of passage marking the important step of becoming a professional practitioner able to work in private practice. If you are wishing to participate in Perceptual BodyTracking, we recommend our own LifeTracking Foundation course which will teach you basic skills in body-tracking. Touch for Health and other kinesiology foundation courses are also welcome. If Touch for Health is your background, you will need to undertake a short bridging course to learn the skills of body-tracking which are fundamental to this professional training. Please discuss this with directly with the course trainer. What can I do on completion of Perceptual BodyTracking? 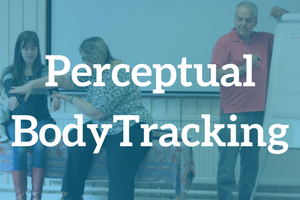 After successful completion of Perceptual BodyTracking (Part One of the professional training), plus a practical assessment, you will have achieved the status of an Assessed Practitioner who is working towards full professional practitioner status. What are my next steps after completing Perceptual BodyTracking? Over the next three years after this course, you will complete Part Two of the professional training, working towards becoming a fully professional Registered Practitioner. This involves completing courses in four Core Subjects, 200 clinical practice sessions, plus mentoring and personal sessions.